When the USA entered the Second World War in 1941 it was in the process of greatly expanding its armed forces. Over the next four years its soldiers would see action in a wide variety of conditions, from tropical Pacific islands to the snow-bound Ardennes in winter. By 1945 these men had a practical and comfortable uniform which could be adapted to the conditions - a uniform that was to spread all over the world after the war. Hasegawa have only made two full sets of figures, with the first being this collection of US infantry. As can be seen, both the number of poses and the number of figures is rather less than the normal soft-plastic set, but the fact that this is made in a hard plastic allows for multi-part figures, which should mean more natural and 'unflat' poses. However in fact many of these are simple one piece affairs (apart from the base, which is separate in all cases). The first two poses pictured reminded us strongly of the second type Airfix U.S. Marines. The third man has a separate right arm and a choice of weapons, but is a slightly odd pose. The crawling figure can also have one of a range of weapons, and he also has a separate head, which means this is cast well without the compromises normally associated with the heads of prone figures. The next man is half leaning half sitting on a small mound, which makes for an interesting piece but not a particularly useful pose. The set includes a bazooka and, unusually, a second crewman to load the weapon. This is a most welcome feature, although they would have been better placed on separate bases rather than one as here. The second man is holding a rocket (hidden from view on our picture), presumably about to load it. The last two figures are the crew of an M1919 A4 .30 calibre machine gun. Once again it is good to see a full crew provided, with the gun being correctly fed by the second man. A fairly good selection of figures. All the men are wearing jackets - something like the M1943 design, along with the M1 helmet and long canvas M1938 leggings. These latter were phased out from 1943 onwards, but given the wide variety of possible uniforms for these men, this one is as good a choice as any. The men all wear a small number of ammunition pouches and carry an entrenching tool, but most are missing a canteen and none have a pack or any of the other accoutrements that most G.I.s laboured under. The arrangement of their pouches is not accurate, but the overall look is much too light, bearing little relation to the burdened troops actually to be seen on the front line. 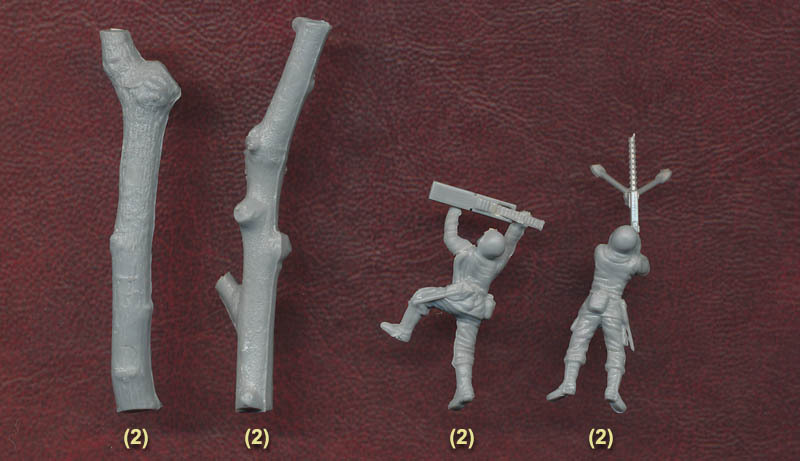 As has already been said, the set includes a choice of weapons for some of the figures, as can be seen by viewing the full sprue. As well as the bazooka and the heavy machine gun, the men have M1 Garlands, M1 Carbines and the Thompson M1921 machine gun. These are all nicely done, although the carbine (on the standing firing figure) is missing its magazine. The set includes extra rockets for the bazooka, but both these and the one in the crewman's hand are far too fat both to be authentic and to fit in the weapon! These figures are crisply sculpted with good detail and natural-looking clothing. Some use has been made of the ability to have multi-part figures, but this is not a set that requires hours to construct. The worst aspect is that every man has a thick plug of extra plastic on his back where the material entered the mould. This must be trimmed off, but it is very difficult to completely erase. Some of the thin parts such as the tripod for the machine gun are quite fragile and care must be used when removing them from the sprue, but the collection of extra items (ammunition cases, a radio and a cable reel) are a nice touch. The two large extras - the logs - seem to have been an afterthought, and while reasonably done they do not really add much to the set as a whole. So, an interesting set, but not one that seems to capture the look or the feel of these men or the war.